Preheat the oven to 250º. Line the bottom and sides of a baking pan with foil. Pat the ribs dry with a paper towel on both sides. Place the ribs in one layer on the foil in the pan. Lightly sprinkle the Worcestershire sauce on both sides of the ribs and rub in with the back of a spoon. Lightly sprinkle both sides of the ribs with the garlic powder, seasoned salt and freshly ground black pepper. Place the ribs meaty side up. Tightly cover the pan with more foil. Bake at 250º for 4 hours, then remove from the oven. Increase the oven temperature to 350º. Carefully (because steam will escape) uncover the ribs. Drain accumulated fat and juices. Brush, or spread with the back of a spoon, your favorite barbecue sauce on the ribs. Return the ribs to the oven and brown, uncovered, for about 1/2 hour. In a covered microwave-proof bowl, heat a little extra barbecue sauce briefly (maybe 10 to 15 seconds) on medium high in the microwave. Serve with your favorite side(s), or how about some asparagus with barbecue butter (see recipe below)! Smack away and enjoy! Use 1 TB of the seasoning for the barbecue butter and store the rest in an airtight container for future use. The seasoning will keep in the pantry for up to six months. Mix the 1 TB of barbecue seasoning with the slightly softened butter; cover and refrigerate until ready to serve with your asparagus. So unique and perfect with your ribs! These look perfectly cooked! They've pulled away from the bone and look ready to fall right off! Gosh, both of your recipes look amazing and would be hubby approved! Those ribs are making mouth water...mmmmmmmm...so fabulous, Bonnie! Those ribs look just perfect with that caramelization and yummy char! Have to try the BBQ butter, it's a new one for us, but must be just delicious over the asparagus. This is such a summer meal for us it makes our hearts yearn through the chilly rain for the warmth that's not too far away now! Your ribs look so yummy, Bonnie! And I am definitely going to have to try the BBQ butter! @Curt @Monet @Lizzy @Cheryl and Adam @Jill/Dulce Dough - Thanks everyone for your complimentary remarks! So nice to be able to enjoy ribs all yearlong with these wonderful oven-barbecued beef ribs...I think you'll find them very competitive with ribs on the grill and much easier! Who would have thought that asparagus (normally considered an elegant side) could be dressed to accompany ribs to the table by adding just a little barbecue butter! 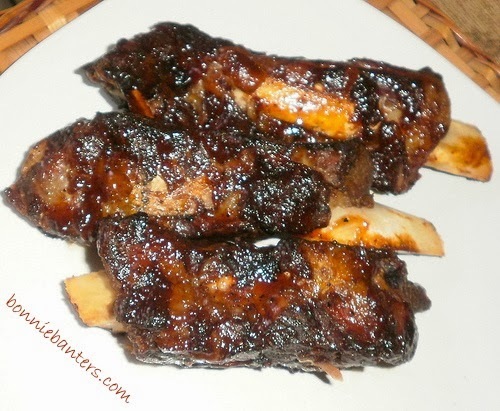 I *love* beef ribs, and it is so hard to find them--yours look fantastic! I also like the bbq butter idea for the asparagus.